Posted on February 5, 2017 by admin in Success. I wanted to write and let you know how well Fifi (now Tiffy) has settled in since we adopted her in late October/early November last year (2016). We were a bit worried about how she’d cope without her sister Miffy, who we unfortunately weren’t able to take, but it doesn’t seem to have bothered her at all! In fact, I think she’s revelling in having 100% of the attention! After a day or two of settling in to her new home, Tiffy very quickly came out of her shell. She’s got such a sweet little character and my mum and I have never known such a friendly, good natured cat. She loves getting strokes and is always purring her little head off. She has even managed to win over my mum’s carer, who had said she was scared of cats and didn’t like them. We absolutely adore her and we’re so glad that we decided to adopt her. 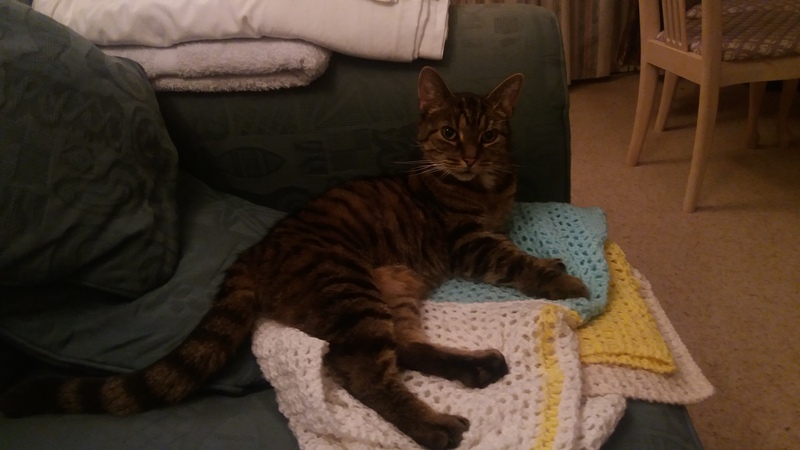 I’ve attached a couple of pics as she enjoys lounging around on the sofa and especially on my mum’s bed – in fact, she usually spends every night and every afternoon sleeping next to my mum, who she seems to have claimed as her own property! I hope that Tiffy’s sister has managed to find a good home and is enjoying life as much as Tiff is. Thanks to everyone at The Heatons.